See the San Francisco 49ers play here in this very large football stadium that was originally built for the San Francisco Giants. http://www.49ers.com/ offers a virtual tour of the stadium as well as more information about the team tickets. The oblong design of the stadium swirls wind around the stands! Bring extra layers during games! 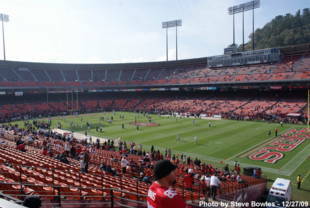 On February 29, 2008 it was announced that the Candlestick Park name would be returning to the stadium in June of that year at the conclusion of Monster Cable's contract. Candlestick Park is owned by the San Francisco Recreation and Parks Department. From the South: 101-North toward San Francisco. Take the Monster Park exit. Continue on into parking area. From the North Bay Area/San Francisco: Take 101 south to the Cow Palace/Third Street exit. Go left and over the freeway onto Third Street. Continue on Third Street and turn right onto Gilman or Carroll. Proceed to the parking lots. Ground was broken in 1958 for the new home of the National League's San Francisco Giants, who had moved west from New York following the end of the 1957 season. The Giants selected the name of Candlestick Park after a name-the-park contest on March 3, 1959. Prior to that, its construction site had been shown on maps as the generic Bay View Stadium. It was the first modern baseball stadium, as it was the first to be built entirely of reinforced concrete. Richard Nixon threw out the first baseball on the opening day of Candlestick Park on April 12, 1960, and the Oakland Raiders played their 1961 American Football League season at the stadium. 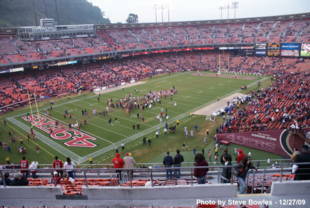 Currently, Candlestick Park is the only NFL stadium that began as a baseball-only facility and underwent extensive reconstruction to accommodate football, as evidenced the stadium's unusual oblong design that leaves many seats on what was the right-field side of the stadium behind the eastern grandstand of the stadium during football games. 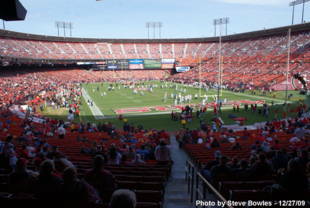 Candlestick is also currently the only NFL football stadium in which upper-deck supports obstruct sight lines from the first-deck seating. The Beatles performed their last live commercial concert at Candlestick Park on August 29, 1966. Was named 3Com Park from 1995-2002, San Francisco Stadium at Candlestick Point from 2002-2004, and Monster Park from 2004-2008. The original Candlestick Park moniker was restored following the end of Monster Cable's naming-rights contract.